"Well that's a bit random!" said a Project Manager I was sat with recently as his project threw up one of those curved balls that only seem to happen at 4.59pm on a Friday, just as you're about to clock off for the weekend. The project had cutting edge visibility so the "random" occurrence in question could be acted upon quite quickly and corrective action was taken before anyone even really knew there was a problem. It meant a later night that Friday though! The Project Manager sighed, "Oh well, the unpredictable stuff is what makes an IT Project interesting, right?" I admire that philosophical viewpoint, but personally, I like starting my weekends on time. I wondered ... is anything really random and unpredictable in IT Projects? Could this have been avoided? Randomness and IT Projects seem, unlikely bedfellows, I mean, a computer's output is dependent upon input - that's what GIGO (garbage in, garbage out) was all about! So it is with IT Projects. Do we just need to get better at identifying when garbage has gone it? Tech journalist, Bill Thompson told Radio 4's The Curious Cases of Rutherford & Fry, "Computers don't do random ... they are a designed to be predictable and the best we can achieve within a computer is what we call pseudo-randomness where you have a complicated seed number that is supposed to be unpredictable and then an algorithm which takes that seed number and generates from it numbers which are supposed to be random. The problem is if you repeat the seed and repeat the algorithm you'll get the same pattern of numbers out." You could illustrate this for your self - if you opened an online random number generator, and analysed results, over time you'd start to see a pattern emerge. So, how can you spot patterns that emerge within your IT Project? How can you start to predict IT Project Management 'random' outcomes - before they cause problems? To find the answer, forget the online random number generator - let's go analogue! Roll with me on this (pun intended). Do you have access to Monopoly or Yahtzee?! Grab the dice, pick a number between one and six and roll them - repeat, repeat, repeat. How many times did you predict the right number? What this demonstrates is the apparent randomness of dice rolling. Dice are, after all, meant to introduce the element of random chance to whichever game you are playing. Who hasn't been six Monopoly spaces away from jail, rolled a double three and exclaimed, "What are the chances?!" What if I told you that even dice rolling were not as unpredictable or random as it seems? The throw of a die is, after all, governed by Newtonian physics so if you could have access to data like the speed of the throw, the starting position of the die and the thrower's hand, the weight of the die, the air pressure in the room, you could, in theory, predict what number would result from your roll. Actually, researchers at the Universities of Aberdeen in Scotland and Lodz in Poland created a sophisticated theoretical model of a die throw (in their study The three-dimensional dynamics of the die throw). They filmed the die with a high-speed camera and considered influences of gravity, air resistance, the friction of the table, and other factors and assessed which of these could most affect the outcome. What did they find was the most important factor? "The initial position of the die," Tomasz Kapitaniak, from the University of Lodz told Inside Science's Ben Stein. There's the lesson for IT Project Management ... the secret of predicting 'random' outcomes lies in knowing the initial, starting position. So, back to that IT Project that delayed the start of a weekend. The Monday after the Friday before, the Project Manager and I had tracked back looking for a trail. We were searching for a missed red flag that might have allowed earlier identification of this "random event" in the future. It didn't take long for us to find the exact moment where the problem started - the initial position. We traced that Friday afternoon bug back to an inadequately tested software component developed weeks before. It had been tested back then, warning signs had been missed and as the software development life cycle continued this one component had become increasingly unstable until, eventually, it fell over. Finding the "initial position" of a problem allows you to correct it and also adjust your processes for the future. In this project, continuous testing of smaller component parts as they are being developed will ensure that this doesn't happen again. The cost of fixing issues in later stages of an IT project is usually much greater than the cost of fixing sooner, as you go along, so it makes business sense to work this way and keep project costs in control. This team had just got busy and missed what their testing had been subtly trying to tell them. They won't do that again! 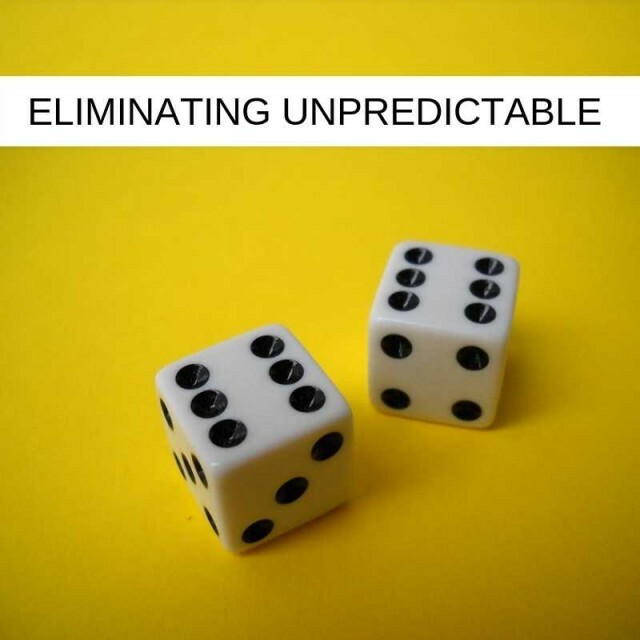 As IT Projects become increasingly complex and crucial to your organisation's strategic business goals, it's important that we all get better at predicting the unpredictable. It can help to have a trusted IT partner run an independent pair of eyes over your IT Project issues and you can buy in end to end Project Management as a Service (PMaaS) solutions that bolster governance and transparency. This will make "random" problems less likely or, at least, easier to track back to. Ultimately though, IT Project teams must accept responsibility for the "unpredictable" because, frankly, nothing is really unpredictable, just unpredicted.